Amy Trubek has radical ideas about food that just might be the most sensible ones you've ever heard. The author and University of Vermont assistant professor of Nutrition and Food Sciences believes the value of a community isn't measured just by its access to affordable grub, but by its support for producers whose food retains a uniquely local flavor informed by the region's air, water and soil, or terroir. To those who embrace the fairly recent — and largely North American — proposition that mega-agriculture is our path to both abundance and thrift, Trubek's "foodie" philosophy might smack of elitism. After all, she is an academic. 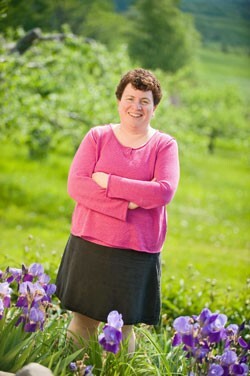 Both at UVM and in her previous positions — as executive director of the Vermont Fresh Network and Food and Society Policy fellow at Missouri's Thomas Jefferson Agricultural Institute — she's devoted herself to the idea that nurturing local farmers and food craftspeople pays off in ways that have nothing to do with our wallets. It's a philosophy that was highly unlikely to fly with free marketers and "Sam's Club Republicans" during the last two decades of nearly flat food pricing. But that may have changed. Now that the price of basic staples such as rice, wheat and milk has skyrocketed an average of 50 percent in the last eight months — and additional hikes are forecast through the summer — it's fair to say the nearly free food ride is over. Suddenly "harvest it in California, eat it in Charlotte" doesn't make so much economic sense. Trubek's just-released book The Taste of Place: A Cultural Journey into Terroir is a shot across the bow of our old system of thought and commerce. But more fundamentally, it shows how a renewed appreciation of the magic of local flavor might just save our collective bacon. SEVEN DAYS: What prompted you to write the book? Were you on a mission to reform America's palates? AMY TRUBEK: [Laughs] A modest mission, maybe. I actually just jump right in at the beginning and describe how I came to appreciate the French term le goût de terroir, or how the flavor and character of certain places are given to its products. I write about the conditions that make French wine unique, describe how wonderful the hickory nuts and fresh apples are in Wisconsin . . . and there's also quite a bit about Vermont. But the book isn't really travelogue. From the start I try to get across that an emphasis on regional flavor shouldn't be dismissed as just another way of describing fringe food or agricultural ways of the past. What I want is to define the term in a modern way so that people can see how valuable it can be to small-scale, entrepreneurial enterprise. And we can start right here, because I believe the concept was pivotal to the emergence of the vibrant regional cuisine we have in Vermont. We buy locally more than any other state. It's quite an achievement. SD: Why did Vermont support local food makers more than other states? AT: Well, we had to, for starters. We are a relatively remote and mountainous state, so it's always been difficult to move our agriculture beyond a certain scale. But that failure was also our success. The fact that we could never succeed the way Ohio and Iowa and California and Utah did at really large-scale farming has, in the end, given us much more space for another farming and cooking model to develop. SD: There's got to be more than topography at play, though. Other states are both rugged and remote. AT: Oh, yes, but you need to start with the basic fact that we were just a bad bet for mega-growers. Then there's our high percentage of people with culinary training, thanks to the New England Culinary Institute. Add the co-op movement that came out of the 1970s, along with a highly engaged public, and you have what you need to make regional cuisine thrive. This is also why so many people are looking to Vermont for inspiration. SD: Is your intent to encourage Vermont to be food self-sufficient again in the way that it was, say, a century ago? AT: No. That'd be nice in principle, I suppose. We can grow what we need, but it's also a matter of having the infrastructure available. We could grow lots of wheat — and have in the past — but there's nowhere to mill it. What we do have are vibrant models for what's possible on a regional production scale, and all those local models are looking better and better as food commodity prices go up. SD: It's been pretty astonishing . . .
AT: Well, we've made a mistake in linking food and agriculture so closely to the commodity-based product system of modern global capitalism, and now we're seeing some real problems in terms of health, hunger, environment . . . economy. I'm not saying that we all need to plant acres of corn, but we might consider being more proactive about the food we choose, and knowing which system benefits from each decision. SD: Though backyard corn may not be such a bad idea in a peak-oil age. If you believe even half of the apocalyptic scenario James Howard Kunstler lays out in The Long Emergency, we'd better embrace a local production paradigm . . . or else. AT: Well, I'm an optimist at heart, so I'd rather concentrate on how emphasizing what's great and particular about local food helps local markets. If that assists in getting us through the new energy age, then great. SD: What is the archetypal Vermont terroir? What makes Taylor Farm cheese, for instance, so distinct from . . . Kraft? AT: That's the great and maddening thing . . . we don't really know. I've been working with Shelburne Farms to document what their cows are consuming. We want to see if there is any relationship between that, the time of the season and flavor of the cheese. It's all preliminary at this point, but I'll keep you informed. SD: So if no one thing determines a goût de terroir . . .
AT: I'll just stop you for a second. One point I try to make in the book is that it's not a completely cause-and-effect relationship between food and terroir; it's something that we make by creating a vibrant local food and farming system. It involves the scale and care of production, how effectively food is brought to market, and how engaged people are in learning about it. It's an environment that supports local food, not just case studies of individual foods. SD: That kills the next question, then. I was going to ask for a perfect Vermont terroir meal. AT: Oh, I can do that, actually [laughs]. I just threw a lunch at Shelburne Farms that was inspired by different ways I talk about local taste. [Shelburne Farms' head chef] Rick Gencarelli and I collaborated on the menu. We did a spring soup with lettuce, mint, peas and sorrel . . . all in season right now. Then there was a tray of Vermont cheeses, of course, and a rhubarb crunch with maple syrup. SD: I'm not sure about the last one. AT: Oh, then you haven't tasted local rhubarb. It's also in season right now, and amazing. Boyden Valley Winery in Cambridge makes a great rhubarb wine. If you want to sit down and have another real Vermont taste of place, serve that wine with locally made bread and cheese, and you're eating the terroir of Vermont in the spring . . . your home.